Tired of Creating Revision Table with regular Table command ? Now, Here is an easy way to create Revision table with revision table symbols. Select place in GA where you want to Insert your Revision table . Don’t worry about size you can modify it later. After Specifying insertion point check command line question . Do you want to add revision now? If Yes type ‘Y’ or for No type ‘N’ and Enter. If you select No option then there will be only Revision table header and Column names . Hence you can add Revision symbols and numbers later. For now I will select Yes option and Proceed to next . Here , Enter required data as per your Drawing ! You can edit Date section also. Note: If you have created revision table earlier or want to change date to current date then Press on icon next to Date Section . When you click Ok on Dialog box then your revision table with all details filled in above dialog box will appear in GA.
Now, Command line ask to Specify destination for Revision Symbol. Specify this symbol near Entities or sections you want to highlight for revision . Now , Press Right click on Esc key to exit from Insert Revision table command. Note: If you run ‘TB_REVISIONTABLE’ or Press ‘Insert Revision table’ tab then this will pop up message as below. How to insert more Revisions in Revision table? 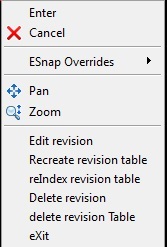 If you want to insert more revisions in your existing revision table then Click on Tab ‘Insert Revision’ next to ‘Insert revision table ‘ on Toolbox toolbar or run Command ‘TB_ADDREVISION’. This will prompt same dialog as above but this time Revision number is 2. DraftSight will auto calculate next revision number . Click ok on dialog box and you will notice that second revision is added in Revision table. Note: If there is no revision table exist in Drawing and if you press this tab for ‘Insert revision’ or Run command ‘TB_ADDREVISION’ then this will pop up alert message as below! How to Insert more Revision Symbols in Drawing ? Note: It will insert last revision Symbol only. Now that you have Inserted Revision table and Symbols in Drawing and if you want to Edit it then you can edit it by pressing Last tab ‘Edit Revision table’ in Revision table section of Toobox toolbar or Run command ‘TB_EDITREVISIONTABLE’. This will give you some command line options as below. you can see these option in GA by pressing Right click inside GA when this command is running. With this you can select any Revision row from Revision table and Edit Revision information. If you find it difficult to select text or if there is no text in Revision row then you can select line below revision row and it will pop up ‘Edit revision’ box. If information in Any revision is exceeding the width of existing revision table cells then you can recreate revision table to better align Columns with this option. However this option is not so useful for this case as DraftSight automatically adjust cells as per content in it. But , if you move any revision row away from Revision table by selecting single row and drag by mouse cursor and you want to align this row with Revision table then you can use this option. If any revision number is deleted then you can use this option to re-index revision table . Suppose if there 1 to 4 revision rows in revision table and if you deleted 2nd row then this option will index revision table and change revision numbers from 1 to 3. Use this option to delete any revision row. Select this option then select row revision you want to delete. If you want to delete complete revision table then use this option. Finally to exit from Edit revision table command use this option. Tip: You can edit insert revision content by simply selecting Revision row and Right click and select option ‘Edit BlockAttribute Values’ or Double click on Revision row. A dialog box with all attribute values in revision row will appear from here you can edit , add or remove any content you want . In case you face any Difficulty or want to know more about DraftSight then feel free to send us mail on [email protected] OR comment on respective Post. I have some tables that were previously editable, but now I’m getting the “Anonymous block cannot be edited” message you reference at the end of this useful tutorial. Any suggestions on how to turn a previously editable table from a block (that wasn’t copy-and-pasted) back into a table? Table created from Revision Table are created as Anonymous block and cannot be edited. This is indetended behavior of DraftSight Toolbox. But for other Blocks you can do one trick to make them editable. Check weather you can edit your blocks and let us know !